As stated in my Snap Judgments for the week, I’ve been somewhat surprised by how critical Gamecock fans have been of Dylan Thompson the first two weeks of the season. I only watched the Texas A&M game once (live, and that was more than enough), so I decided to take a look at the ECU game and Thompson’s performance a little more closely to see what I might be missing. I went through all 38 passing plays, and looked at Thompson’s accuracy and, as best as I could tell with limited video, his decision-making. I also looked at the performance of his receivers and some of their route running and where there were egregious drops. I have no formula to determine how he graded out, but will allow you, the reader, to determine if you feel better or worse about his performance on Saturday. Watching the game live, the first thought is “bad throw”. However, if you slow it down you’ll see that while the pass is definitely a little high, it is a very catchable ball. I think if you ask Little Nicky Jones, he would tell you he should’ve caught it. I think Steve Spurrier would say the same. Roland runs a standard hitch route, and settles in his spot but the throw sails to his right. Probably a bad throw all the way, although only Thompson and Roland know if Shaq hit his spot. We have to at least consider the possibility the ball was where it was supposed to be and Roland was not exactly where he was supposed to be. But, we’ll put the blame on Thompson for this one. Byrd runs a deep post, a play he has been successful on a few times in his career, and Thompson simply overshoots him. Byrd has a corner running with him all the way, so it’s not a huge miss. Sometimes you take a shot deep, and occasionally it works. This time it didn’t. Shallow crossing route by Cooper, Thompson throws slightly high, but a linebacker is draped all over Pharoh and drops him right after the catch. Another hitch route by Roland, this time to the other side. Thompson drops three steps out of the shotgun and fires a strike. Good technique, good throw. Another deep throw, this time down the left sideline. Thompson’s throw is perfect, but Byrd’s right arm is held by the ECU cornerback so he can’t extend for the catch. ECU was the beneficiary of a similar play earlier in the game where pass interference was called. Here it was not. Cooper runs a deep out route, and Thompson shows his arm strength with a long throw across the field. Good route, very good throw for a nice pickup. Interesting play here as Anderson runs a shallow cross, pauses briefly and then starts to move again. Thompson throws to the spot where Anderson slows down, and the pass is behind him. I truly don’t believe this is a bad throw by Thompson. I think it’s either a miscommunication between 17 and 81, or Anderson just ran a bad route. Color analyst Kelly Stouffer initially says it’s an errant throw, but then on replay says the route could’ve been run better. Very good route by Brent here, I believe it’s a hitch similar to what Roland had run earlier but a little shorter. Brent settles into the crease between defenders and Thompson threads the needle. Nice looking play for a first down. There are a small number of what I would consider bad throws by Thompson on the night, and this might be the worst. Brent runs a skinny post and is blanketed all the way. Thompson trusts the route and throws to the spot where he thinks Brent will come open, but he throws behind and is lucky to not be intercepted. Thompson is flushed out of the pocket and throws against his body to Anderson about 12 yards away. It hits Anderson in the numbers and he drops it. Don’t know if he would’ve picked up the first down, but he had room to run. Screen, nothing to write home about. Similar route to Brent on the previous series. Not a perfect throw, but not one that Cooper would complain about either. Screen. Roland does all the work here. He’s slick in the open field. Wheel route to Davis, and the prettiest throw of the night down the left sideline. Thompson hits him in stride, and with a little field awareness 28 would’ve had a touchdown. Screen, another nice run by Roland. Here’s the play that interests me the most. Stouffer on the broadcast got all over Thompson for making a bad decision here. I don’t agree. Dylan had two choices – take a shot near the goal line with Adams, or hit the check down to the RB and get a few yards. There are definitely times to go to the check down, but I don’t blame 17 for taking a shot here. Adams is bracketed by a corner in front and a safety behind. Thompson throws a laser into the smallest of windows, just out of reach of the corner. Yes, the ball is high because it has to be for Adams to have any chance to catch it. Adams leaps and the ball hits him in the hands, but the safety comes in from the back and lays a lick on him and the ball falls to the turf. Again, watch the throw, it is perfect. When Steve Spurrier said the receivers are going to have to start coming up with some tough catches, I guarantee you he had this one in mind. If first down was the good, then second down was the bad. Thompson goes for the touchdown in the corner to Jones. The problem is ECU is playing deep safeties across the field and the play never has a chance. Another one we’re lucky wasn’t intercepted. Just a bad play call, and/or bad decision. And third down was the ugly. Roland is open over the middle and Thompson throws high. I initially thought this was another one of those tough catches that has to be made, but even with Shaq’s leaping ability he barely got fingertips on it. For the Thompson detractors, if you want a series to complain about, this is probably your best bet. Say it with me – screen. This time receivers run downfield routes. Thompson goes through his progressions and decides to dump it off to Davis. Smart move. Nice play here by Thompson and Roland. Both recognize the corner blitz at the snap. Roland breaks off his route, and Thompson fires a strike to not only avoid a sack, but pick up another first down. Nice middle screen, Thompson doesn’t have to do much here. Easy throw here for Thompson to Brent as the Gamecocks go trips left and ECU has a breakdown in their secondary. Their missed assignment gives us an easy six. Crossing route behind the linebackers and in front of the DBs. Thompson finds a window and makes a nice throw. Screen DROPPED. Guess even we were getting bored with the screens. First catch of the redshirt freshman’s career on the check down. Maybe the most frustrating throw of the night from Thompson. He does a nifty job of eluding defenders, then overshoots Anderson in the back of the end zone. I’m not going to say it was an easy throw given the duress he was under, but it wasn’t that difficult either. Rollout by Thompson, low throw, Roland slips down. Dangerous throw into double coverage here. Fortunately both defenders were behind Roland. Check down to Davis here for a critical first down. At least it looked like a check down. As fast as he got rid of it he may have known that was his best option to get the first. Final throw of the night, a beauty on a play action to Adams. Once again Dylan shows nice touch. I’m not sure what all of this means, but when I watched the pass plays back again it honestly made me feel better about 17, and I didn’t feel particularly bad in the first place. I didn’t see an abundance of bad throws or bad decisions, the two things I kept hearing Saturday night. 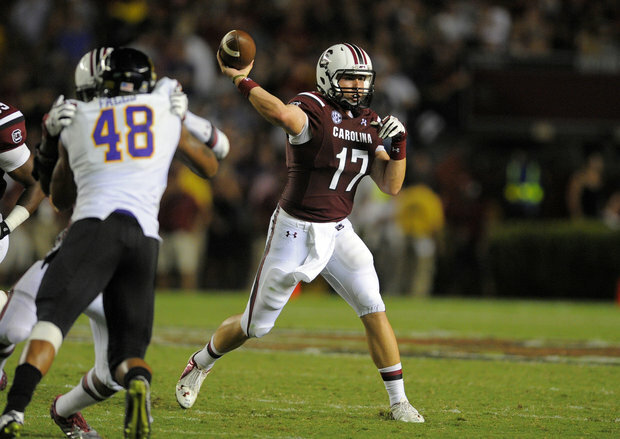 Understand, I don’t think Dylan Thompson is going to be a first-team all-SEC at the end of the year. But I also don’t think he’s going to get benched this season for any other reason except an injury. My hope is that even though he’s a veteran he’s still adjusting to this being HIS team, he’ll settle down and have a very solid season for us. How many completions/ incompletions was Dylan under center vice Pro-style, percentage wise, or did you notice?? Didn’t notice. I remember one running play from under center when we were in the I-formation, but no pass plays stick out. Thanks for taking the time to break all this down. One thing that Dylan seems to struggle with is the ability to “feather” the throw on a rollout to an open receiver. There were a couple of times where a soft throw to an open receiver would have gotten the TD or first down. I hope we can chalk it up to nerves, but recognizing this going forward will pay dividends in the future. And yes, I do agree that the ability to hit the screen and check down throw is not something we should ever take for granted!